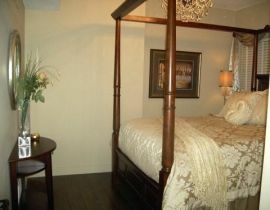 Welcome to our romantic Kelowna bed and breakfast. Nestled against the hillside we overlook the breathtaking Okanagan Lake and the city of Kelowna. You are now in the heart of British Columbia wine country. Only minutes away from Kelowna's many world class wineries, golf courses, beautiful beaches, hiking trails, cycle paths and our amazing ski hills nearby. The Okanagan Valley is truly a four season destination and our Kelowna bed and breakfast is the perfect location for a relaxing getaway. This Kelowna B&B is the perfect lodging with private one and two bedroom suites. The Hopeless Romantic bed and breakfast include private entrance and patios with Okanagan Lake and Valley views. 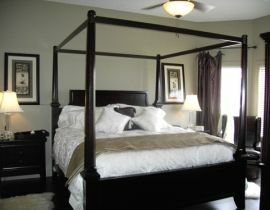 Suites are luxurious with super comfy king and queen beds, fine linens, fireplaces and romantic chandeliers. Each beautifully decorated B&B suite has a fully equipped kitchenette or buffet stand and private en suite with shower. Sit on the patio at night, sip on a fine glass of Okanagan wine and overlook a panorama of city lights. There is always a hint of romance in the air. But remember, our Kelowna bed and breakfast is not just for couples but for all lovers of life! Our Kelowna Bed and Breakfast is open all year round. Fully self contained and beautifully decorated. 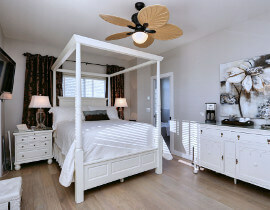 Master bedroom with luxurious king or queen four poster beds. Fine linens and luxury pillows. Private en suite with shower, tub, hair blower and iron. Cable TV, movies and music.